Jane Lane is a fictional character created for the MTV animated series Daria. In the show, Jane was Daria's best (and only) friend (or amiga, as Jane once referred to Daria) and as of the show's final season was aged 18 years. She lives at 111 Howard Drive in Lawndale, and graduated from the local high school, Lawndale High. She is an aspiring artist and has created many unusual paintings, drawings, and sculptures. 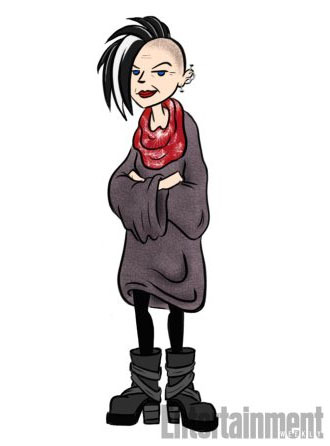 Like Daria, Jane too is cynical with a biting wit, but is better adjusted and somewhat more outgoing. In the first season, Jane's voice was lower and gravelly, and she usually spoke in a mutter. She would go on to have a louder, more expressive voice. In the MTV book, The Daria Diaries, Jane's motto is quoted as: "Every cloud has a smoky gray lining." Early history about Jane's life that was revealed during the show is scarce, but there are a few facts that were confirmed by the character herself. She was, in her prepubescent years, a member of the Girl Scouts, during which time she was forced to attend a nature camping event, a memory she detests. This was revealed in "Antisocial Climbers." "Reburb" says she was Mystik Spiral's Director of Band Graphics "until she got fed up with the whole spiral direction controversy" (i.e. whether the spiral was going in the right direction on the logo). Other camping events Jane has partaken in include Mr O'Neill's overnight field trip to local woodlands (as depicted in "Antisocial Climbers") and a summer vacation to the Ashfield Artists' Colony (as depicted in the Daria telemovie, Is It Fall Yet?). Despite these infrequent occasions, Jane remains adamant that she does not enjoy camping in any sense of the word. Jane had her first serious romantic relationship at the age of 17 with Tom Sloane, the only son of a wealthy local family and then a student of Fielding Preparatory Academy. The relationship ended less than a year later when they both realized, amid the controversy over Tom kissing Daria, that it had run its course. Jane and Tom remain casual friends but are rarely shown talking in fifth-season episodes or the final movie, Is It College Yet?. At the age of 18, Jane graduated from Lawndale High and was accepted by Boston Fine Arts College into the midterm freshman class. Because the show ended before Jane actually began attending the college, her current status is ultimately unknown, but it is assumed that she still attends the college, socializing with Daria, who attends a college in the same city, on her free weekends. Whether she achieved her goal of losing her virginity the day she entered college is unknown. "Daria's closest friend and confidante never gave up on her ambitions: She's a professional artist who's sold a few pieces, though she still hasn't "made it big." She lives in a loft in SoHo with her husband who's an archaeologist and rarely home, so luckily the besties get to spend tons of time together. They enjoy going to art shows and film events where you're supposed to socialize, but — surprise! — they only talk to each other." Note: Information on characters' current ages and birth dates are highly speculative. See "Jane and the Lanes" for canon details. "Jane" ran several websites on MTV during the show's original run. In 1999, she had set up "Jane Lane's Palace of Pixels", which contained wallpapers and the Gourmet's Guide to Pizza Pleasure, a guide to the pizza places "within a 20-mile radius". Howdy, complete stranger! You have stumbled upon my homepage: a rich melange of sight and sound, word and image, ultimately reduced to soulless, impersonal code. I have wrestled with my inner demons and endured the pain of self-revelation so that you may be entertained. Van Gogh had his paint, Rodin his clay; I have the icy coldness of the Internet. Excuse me, I have to go smell a crayon. This page is part of the Genius-In-Waiting Webring. "Pizza King 9.7 Perfect cheese-to-crust-to-sauce ratio. Just enough unidentifiable burnt things. "Pizza Palace 8.5 Outstanding mozzarella stretch. Wobbly tables mar otherwise yummy experience. "Pepe's Pizza 8.0 Creates bright orange oil puddles on paper plate. Visually exciting! "Three Brothers Pizza 5.0 Skimpy on the oregano. Poorly rendered gondola mural may depress appetite. "Jo-Jo's 4.5 Fancy brick oven place. Overly friendly waiters point scary pepper mills at patrons. Offers cheeseless pizza, a foul desecration. "Two Brothers Pizza 3.2 Could use another brother -- slices 20 percent smaller than average. And they get testy when you pull out the tape measure. Lots of pictures of actors no one's ever heard of. "Pizza Forest 2.0 Annoying people in animal suits just stand there when you hit them with the menu. Pizza tastes like frozen supermarket kind, only worse." In 2000 (Wayback links may no longer work), she started the auction site "LaneBay": "the web's first family-style online art auction. Since Mom and Dad often forget to pay the mortgage, it may be the only way I can hold onto my garret." Jane's primary interest is art; she enjoys creating, painting, sculpting, drawing and sketching. Her favourite type of art tends to be the surreal and macabre, and in the IIFY "Post-Movie Chat" said her favourite artists were "I like anyone who has exhibited anguish- if you cut an ear off, that's also a plus". She also has a vague interest and substantial talent for running, in which she usually participates when emotionally overwhelmed. Her favorite food is pizza and her favorite television show is fictional oddity news program Sick, Sad World. Jane's only real dislikes are materialism, conventionalism and commercialism, all of which her personality overtly disowns as components of a society and as social expectations. "The F Word" shows that Jane could be great at conventionalism and fitting in, but she deliberately stays on the outside. Jane also has a dislike for math and struggles to pass it ("Gifted", "See Jane Run"). Her academic performance in other subjects is never made clear, but it is implied that she is less successful than Daria or Jodie ("Gifted", "Prize Fighters"). In his praise for the series, the Nostalgia Critic referred to her as a "straight C student", but in fact she was only ever referred to as having straight Cs in mathematics. Jane Lane (on right) with Daria (on left). Jane is the first and only friend Daria has ever made, by Daria's own admission. Despite her history of deliberately isolating people and walling herself off, she almost immediately befriended Jane after the girl showed a similar cynical sense of humour. In "The Daria Diaries", she early on described Jane as "snide, resentful, and anti-social. Finally, a friend." In "Is It Fall Yet? ", Daria admitted to admiring and liking Jane's aura of confidence: "you know exactly who you are, and nobody's ever going to con you into thinking you don't." Ironically, at that point Jane had indeed been left confused by her sexuality after Alison deliberately confused her; Jane didn't admit this to Daria, instead enjoying the compliment. "Hi, I'm Daria, go to hell"
In a contrast to Daria, Jane has openly sought after men and been openly sought out by them. In "The Invitation" and "Daria Dance Party", when noticed by boys at social functions, she tried to get Daria to go along with it too. In "The Invitation", Jane went off to the "make-out room" with a boy dubbed "Bobby Bighead" that she'd only just met. To her dismay, he was a rubbish kisser. In both "See Jane Run" and the later "Life in the Past Lane", Jane ended up getting involved in new pursuits - the track team and retro-swing - because of a guy, and got defensive when criticised. Both relations lasted a few weeks but showed an unfortunate trend of Jane's: she can pick total jerks. 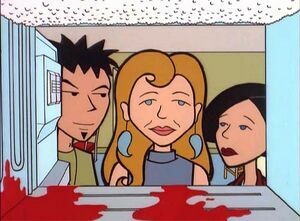 In Evan's case, when he showed he looked down on Daria and thought Jane shouldn't hang with "losers", she instantly cut him off. Almost two years later, with Nathan, she initially put up with his bursts of control freak tendencies and his obsessions over being a retro 'purist'. After he got too aggressive and obsessive with it, she broke up with him. Her longest relationship so far has been with Tom Sloane, who she met in "Jane's Addition". The relationship begun to decline after a few months but neither Jane nor Tom would break it off - and while still dating Jane, he kissed Daria, a situation that caused months of tension between the girls. In "My Night at Daria's," Jane remarked that she planned to lose her virginity at 11 a.m. on her first day at college. Glenn Eichler said in a June 2005 interview that Jane could be "straight and [bi]curious," and left open the door to speculation for either character. Jane is surprised to see her mother's in the house; also pictured, her brother Trent ("Lane Miserables"). Jane's parents are Vincent and Amanda Lane, two artistic personalities with a very relaxed, uninvolved approach to parenting. Jane is surprised when she sees her mother is home, and is visibly annoyed when she does her "if you hold a butterfly" speech on parenting; despite this, she shrugs off her parents style as "benign neglect that's served us well" and never acts bothered about their absence. Jane is the youngest of the Lane family, her older siblings being, in ascending order, Trent, Penny, Wind, and Summer Lane. Trent is a perpetually lazy grunge rock musician who performs in the garage band Mystik Spiral; Penny, a disillusioned backpacker with a fondness for animals; Wind, an emotionally damaged three-time divorcee, and Summer, a worn-out mother of four, including Jane's niece Courtney and nephew Adrian who frequently run away from home. Jane has said ("Pinch Sitter") she's had to babysit Courtney and Adrian, and invented a game called Cemetary for them (the first person to move or make a sound loses). Jane has a very bad relationship with Grandma Lane, who is pissed off with her for no apparent reason. In an internal production bio for Jane, seen in the Complete Animated Series DVD, it's mentioned: "It might be funny if she came from a super-rich, absentee family, and she and Daria always came up with ways to scam money for their hare-brained schemes". The "absentee" part was kept, the wealth part was dropped. Jane and Trent were the only two Lanes residing in the Lane household for the duration of the series, with her relying on him for lifts, favours, and support. She's often amused or irritated by Trent's laziness and habit of practicing really loudly. In times of crisis, Jane turns to Trent for help or support, and he's shown a sharp insight when it comes to serious problems with her. When Jane was applying for college, Trent took a passive-aggressive approach to it and referred to it as selling out; he later admitted he was just upset about losing Jane. She reassured him that just because she was moving out, it didn't mean he'd "get out" of being her brother. With her now in Boston, it is presumed that Trent is now living alone in the house but still with a firm loving relationship with his sister Jane. In "Is It College Yet? ", Jane was accepted into Boston Fine Arts College. 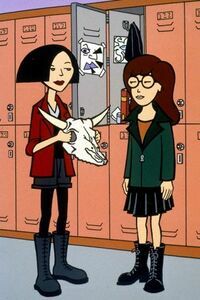 Jane is often portrayed in Daria fanfic as an unrecognized artistic genius, a theme she herself feeds into (e.g., her daydream in the episode, "College Bored"). It is not uncommon to read stories in which Jane manages to sell her artwork for large sums of money and gain considerable media attraction as well. In Wouter's comic "Brushed off" Jane is depicted owning a loft which she uses as both her workshop and her living quarters. Later in that story she is seen welding, sculpting, spray painting and painting traditionally, her work being displayed in an exhibit called "Tools of the trade". Jane's art loft in "Brushed off"
This stereotype was much more common in fan fiction written before "Jane's Addition." This interpretation of Jane was derived from the fact that in the first three seasons Jane would tease Daria about her obvious crush on Trent. 'Shipper fan fiction writers took the next step in having Jane be an active participant in bringing Daria and Trent together, with Jane sometimes going to extremes. This stereotype was called "Yenta Jane," after the matchmaker character from Fiddler on the Roof. A highly vicious piss take of this trope was Smijey's Day of the Yenta. Jane appears to have had no friends before Daria arrived, but still seems to be more outgoing and functional than Daria herself. 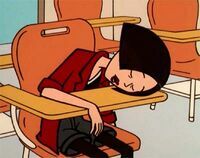 In this trope, writers assume Jane - as with Daria - had a very grim, lonely time at school until Daria arrived, and may go into detail. Stories using this trope include "The Last Days of Solitude" by Jon Kilner and the second 'book' of "Smoking Mirror" by The Angst Guy. In the Latin American dubbing, she was voiced by Gisela Casillas. June 2005 interview with Glenn Eichler on DVDaria, conducted by Kara Wild, including speculation on Jane's sexuality. January 2006 interview with Glenn Eichler on DVDaria, with details on how Jane's name was chosen for the series. May 2006 interview with Anne D. Bernstein on DVDaria, conducted by Kara Wild, with interesting clues as to the origin of this character's appearance and interests. This page was last edited on 20 May 2018, at 19:20.